The crisis of 2008 was for many a “black swan” as US subprime leverage surprised in its crisis spreading across the world infecting all economies. Some will argue they knew it was coming, but no one understood the full global impact. The “grey rhino” problem for the present markets is more appropriate as it hits at the large, visible threats to global growth that are ignored – namely trade wars, US government shutdowns, Brexit, tightening monetary policy and China growth. The mood swing for markets continues apace. The blame for today’s rising fear over greed comes from China President Xi who warned against “black swans” and “grey rhinos” amid the economic downturn. Xinhua reported that Xi instructed officials to "prevent and defuse major risks" across a range of fields — politics, ideology, society, science, and technology — to "ensure a healthy economy and social stability.” The point of fear drives on Xi sounding worried about the economy and the chaos that could follow from a larger economic downturn. Many see this as China’s Minsky moment. Others blame ongoing trade war talk as the US plans a formal extradition for Huawei executive. Against this backdrop, the other news for today has been better – starting with Korea GDP beating with government spending driving, continuing with UK unemployment dropping to 44-year lows, extending to German ZEW where morale brightens despite the list of global worries. The equation for Europe and growth in 2019 matters as many see the Italian issues resolved or kicked down the road, the political mess of France and Germany less problematic, the auto and other environmental rules accepted, all leaving upside surprise risk to a rather gloomy region. The role of the IMF WEO update yesterday matters in counterbalancing this story. 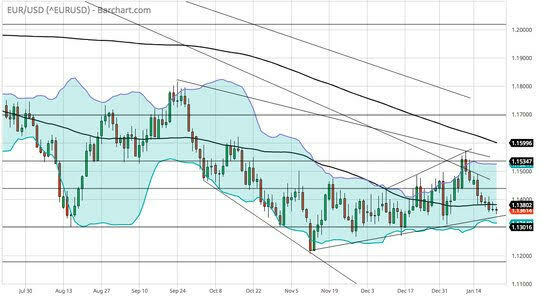 For today, the risk-reward game maybe best measured by the EUR/USD where the drop below 1380 and the 55-day moving average opens the risk for 1.1300 trend support tests and breaks. Question for the Day: Is the IMF outlook for global growth too optimistic? The history of the WEO and its role in setting the tone for central bankers and politicians in the G20 and Davos is important to consider particularly at the start of a new year. The IMF has a long history of overestimating global growth. 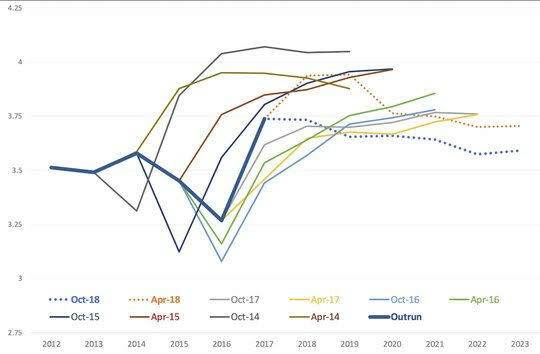 The forecast error from 2009-2018 was 17.9% of the total 2018 global GDP or about $10trn. This optimism bleeds into policy reactions and has a cost.